As is the case in most European destinations, adding gratuity to a bill is optional and therefore not necessarily expected. This concept can be difficult to swallow for those of us who come from cultures where service workers rely on tips. The salary structure for employees in the service industries in Amsterdam (e.g., food servers, taxi drivers, hotel bellhops) is much different than, for example, that of their American counterparts. They are paid fully by their employing establishments and do not need tips to supplement their incomes. That said, it is not uncommon to round up a bill to the nearest whole euro or leave extra small coins (slightly more for larger bills) if you feel you've received very good service. Tips will certainly be appreciated and there is nothing wrong with bringing a little bit of your own culture (i.e., one where tipping is the norm) to a foreign place. In short, the decision to leave gratuity is entirely up to the patron. While this primer on tipping etiquette is meant for clients of American hotels, most of these recommendations are practical for the Netherlands as well and can spare visitors the risk of awkwardness or embarrassment. 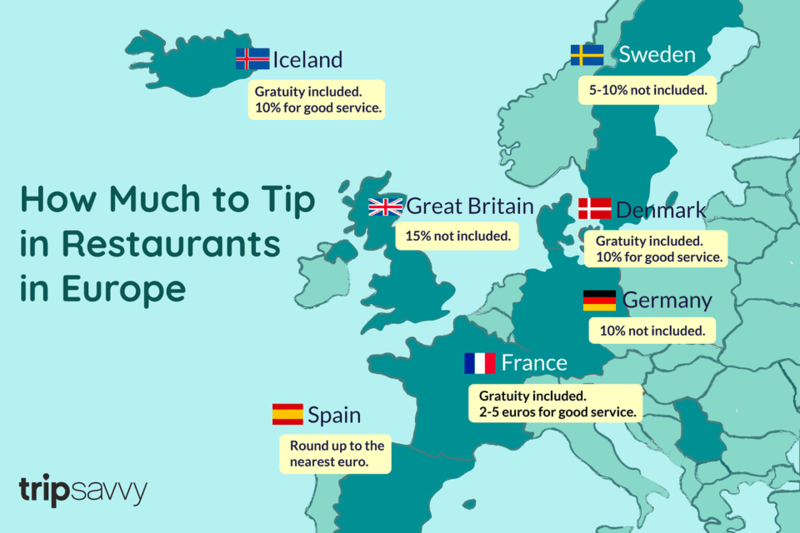 Tipping 20 to 25% is unheard of in most of Europe, and Americans traveling in Europe should read up on the tipping practices of each country they visit. That said, tipping practices vary considerably from one European country to another, so travelers who plan to include the Netherlands on a multi-country trip should be aware of international differences. In France, where a standard 15% gratuity is included in the bill, a few coins for a drink or two to five euro for a restaurant meal (depending on the total price) is sufficient to reward especially good service, even in ​Paris; in other situations - in taxis, museums and theaters, and hotels - tipping practices vary. In Germany, by contrast, rounding up to the nearest euro at cafés or tipping 10% at restaurants is a common practice, whereas tipping at hotels is less so. In Spain, it's possible to round up the total amount of the bill as a tip, but the practice is rare; our Spain Travel expert conducted a survey that shows that only an upscale restaurant bill would warrant a tip, provided that the service was satisfactory. In the UK, tipping 10 to 15% is standard at a sit-down restaurant or large pub, unless the establishment already levies a service charge. At smaller pubs in Ireland, offering the bartender to pour himself a drink on your tab is an acceptable form of tipping. Even pricey Scandinavia has tipping practices which vary from country to country. Denmark includes gratuity in the bill, but visitors can show their appreciation by rounding up the bill or tipping up to 10%. The same is true for Iceland. Tipping by rounding up or adding 5 to 10% of the bill is less unusual in Sweden. In Norway, however, tips are left in a wider variety of situations, as our Scandinavia Travel expert reports.